Recently SciencePoles interviewed Dr. Ralf Döscher, Senior researcher in ocean and climate modelling at the Swedish Meteorological and Hydrological Institute's Rossby Centre. Dr. Döscher is also a Project Co-leader in charge of numerical modelling for the DAMOCLES project and was willing to tell us a bit about the kind of work he was doing within the project. Could you describe what exactly your duties as a Project Co-leader of the DAMOCLES project include? I coordinate numerical modelling activities within DAMOCLES. During the setup phase I was responsible for constructing the work plan for the project. Now that the project is underway I oversee modelling activities and try to identify possible synergies out of the combination of the activities of the different groups modelling. Furthermore, I network and manage collaborations with external groups from Russia, the US, Canada and possibly Asia. How did you become involved with the DAMOCLES project? At the Swedish Meteorological and Hydrological Institute's Rossby Centre where I work, we focus on regional climate modelling. Initially we concentrated only on Northern Europe. We developed models aimed at describing and predicting the behaviour of the ocean, sea ice and the atmosphere. Integrating these different models can help to determine and predict the interaction between the ocean, ice and the atmosphere. Both research institutes and meteorological services in regions outside of Northern Europe have become interested in using these integrated models. Recently we started applying our regional simulation tools for the Arctic, and when DAMOCLES was initiated, the project found the kind of models we provide to be very useful. Which natural phenomena are you currently trying to model within the DAMOCLES project? What is the significance of these phenomena you are trying to monitor and how might these models be of use? We try to model variability of the Arctic ocean-ice-atmosphere system together with the recent trend in diminishing Arctic sea ice cover. Both are results of complex interaction between large-scale changes and Arctic responses to these changes. Even regional interaction within the Arctic plays a role. Examples of important phenomena are the inflow of Atlantic and Pacific waters into the Arctic Ocean, and the relationship between ice cover and air humidity. As a result of our studies, we expect to obtain a better understanding of relevant mechanisms in the Arctic so that we can improve the models we use to simulate recent and future changes. This is expected to result in reducing uncertainties in modelling future climate change in the Arctic. Climate scenarios are always uncertain due to unknown future greenhouse gas emissions, uncertainties inherent in models and natural variability. Two identical climate models starting from a slightly different initial conditions (start fields) may after a while diverge and give different results over a period of a few years or even decades. Therefore, many runs of the model using different levels of greenhouse gas emissions and different decadal-scale behaviour are necessary in order to collect adequate statistical data on the future of climate change. The better formulated the model and the smaller the uncertainty due to the model, the better the statistical data. Do you think these models have the potential to evolve or change as new data are received, or are they relatively solid? Most of the model components are robust with respect to the phenomena they try to describe and do a good job of predicting from a seasonal to a ten-year timescale. Models of ice cover in the Arctic Ocean can simulate the reduction of the actual extent of sea ice in the 1990s quite well. However it is necessary to improve important details of the model concerning the interaction between the ocean, the ice and the atmosphere in the Arctic, such as radiation, the reflection of sunlight by the ice (albedo feedback) and the relationship between atmospheric turbulence and the formulation of clouds. Such improvements are needed in order to simulate longer-term variability and to enable more realistic coupled ocean-ice-atmosphere simulations. Coupled models (models that integrate two or more standalone models describing a particular aspect of the climate) are particularly sensitive. Coupling standalone models adds complexity to the simulated system, and can make validation with observational data more difficult. Coupled models are more sensitive than standalone models because energy is exchanged between the systems described in the component standalone models, and sometimes the energy release might "fit" into one standalone model but not the other. This problem stems from the fact that oceanic and atmospheric models are often developed independently of one another. Each model works fine on its own, but when you couple them together complications arise. For example, a model of atmospheric behaviour might be able to describe a heat flux from the atmosphere to the ocean. This is OK for the model of the atmosphere, but it might be too high for the model of oceanic behaviour. If no oceanic model is coupled to the atmospheric model, this problem is not directly relevant. However if the two models are coupled, then things become more complicated. How do you go about creating computer models of natural phenomena you are trying to monitor and predict? The computer models we use are based on well-known natural laws governing the circulation of water and air. These laws describe, for example, temperature change depending on the speed and direction of water and wind within a given time. However, these natural laws tend to be highly non-linear. This means that it becomes difficult or even impossible to predict what can happen after a certain given time. A good analogy would be the movement of billiard balls on a billiard table. The physical laws describing the pathways the balls can take once set in motion are known, yet after a number of collisions, small irregularities on the surface of the table make it impossible to predict the exact movement of each ball. The irregularities one encounters in Arctic ocean and atmosphere modelling correspond to less well-understood processes such as cloud formation, sea ice behaviour and driving forces. In weather forecasting, this makes it impossible to make accurate predictions for longer than seven days. This does not mean that more general climate situations cannot be simulated, however. Are there any parameters you must take into account? Climate simulation models have underlying non-linearities, which means that there will be variations in the climate scenarios we try to predict. Often these variations naturally occur in ice-albedo feedbacks, atmospheric circulation and feedbacks between surface ice and snow, but not necessarily at the time predicted by the model. Even nature is "uncertain" as to whether to favour the one type of variability over another, because the "choice" depends on the difficult-to-predict outcome of a "competition" between different non-linear processes. Put simply, the Arctic climate is predictable only within certain limits. In the Arctic, natural developments could for example lead to an anomalous ten-year period. It might be possible to simulate this anomalous period with a model, however the time frame might be staggered. To make things even more complex, Arctic variability is affected by large-scale changes. Changing atmospheric circulation patterns can trigger changes in the Arctic that create new initial conditions and restart the whole "competition" between different non-linear processes. The modelling work in DAMOCLES focuses on quantifying this kind of predictability, both the natural and the computer-generated components. Therefore we try to assess the sensitivity of the coupled system with respect to both initial conditions (start fields) and the physical description of non-linear processes. The former allows us to approach natural predictability while the latter gives us insight into the limits of our understanding. Simulating regional Arctic climate with models allows us to assess the part of Arctic climate variability generated inside the Arctic coupled system. Simulation experiments with only slightly different initial conditions (start fields) can lead to notably different end scenarios (particularly ice thickness and air temperature) within certain periods of time, while many runs of the models can result in similar end scenarios during other periods. Similarities and differences between models indicate there are most likely externally driven or regionally generated processes. It is even possible that thresholds (bifurcation points) are passed, which can lead to different end scenarios. Do you sometimes get drastically different results using the same model? If so, why? Results are often different due to internal Arctic variability. Especially in fully coupled models, results can be drastically different for individual years due to non-linear interactions between the individual phenomena that make up the coupled system. This behaviour is not purely due to model inadequacies. Partly it is a reflection of natural sensitivities. This is known as the "butterfly effect", in which small changes at one point in the process can sometimes lead to drastically different effects as the model continues to run. Do you try different models when you are trying to predict the same climate phenomena? In DAMOCLES we use a hierarchy of models to cover many aspects. As far as general circulation models are concerned, we use different models as well as different versions of otherwise identical models to cover predictability. Often this approach of using many model runs and compiling statistics on the results is called an "ensemble" approach. 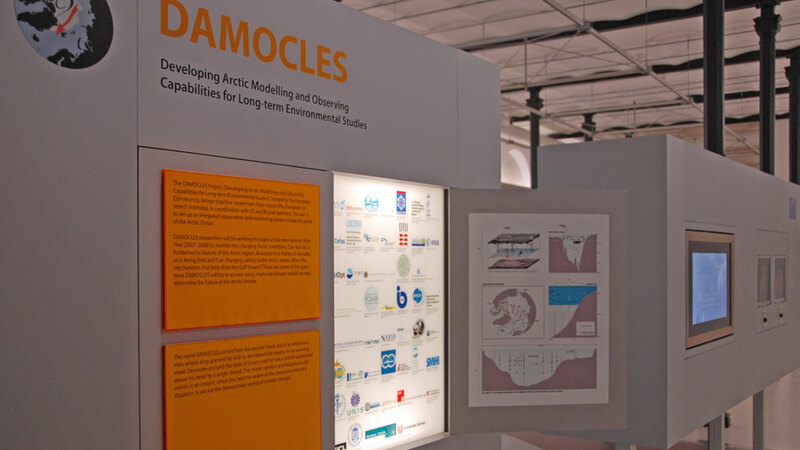 One of the main goals of the DAMOCLES project is to have better predictability of Arctic weather and climate. How would you judge the progress that has been made thus far in this regard? We are just beginning. So far there has been a lot of setup work and sensitivity experiments. The weather forecast models aim at better prediction capabilities using extended data assimilation. The first improved ice forecasts are already available and the first results concerning climate predictability are expected by the end of this year. The climate models' capabilities are developed with the help of sensitivity experiments. We expect to obtain major improvement of model performance by comparing the results our models predict with observations conducted within the context of the International Polar Year. We can use observed data and assimilate it into our models, and the models can be used to fill observational gaps. This is known as data assimilation. This can be done without violating the basic dynamics of the model. The resulting fields, often called "reanalysis," can be considered the best possible overall description of the recent behaviour of the ocean and the atmosphere in the Arctic. These reanalysis fields can be compared with the results obtained purely from the model in order to judge the performance of the model vis-à-vis the physical reality. Ralf Döscher is a senior researcher in ocean and climate modelling at the Swedish Meteorological and Hydrological Institute's Rossby Centre. He is responsible for global modelling activities and model development. His resarch focuses on Climate change, variability and predictability in the Arctic and Baltic Sea regions.